Thu., Nov. 17, 2016, 11 p.m.
PORTLAND, Oregon – As if Eastern Washington needed any more bits of motivation this week, coach Beau Baldwin threw another one onto the fire Monday afternoon. “A 10-win regular season, I don’t think that’s ever been done,” Baldwin mused as the Eagles practiced at Roos Field ahead of the regular-season finale at Portland State. That’s not quite true; Eastern pulled that trick back in 1997 en route to a spot in the FCS semifinals. However, that squad opened the season with Rocky Mountain and Eastern Oregon – not quite the gauntlet faced by this year’s team, which is 9-1 against a schedule that opened with Washington State and North Dakota State. The bottom line: If you factor in degree of difficulty, the Eagles will own the best regular season in school history if they can beat the 3-7 Vikings on Friday night in downtown Portland. 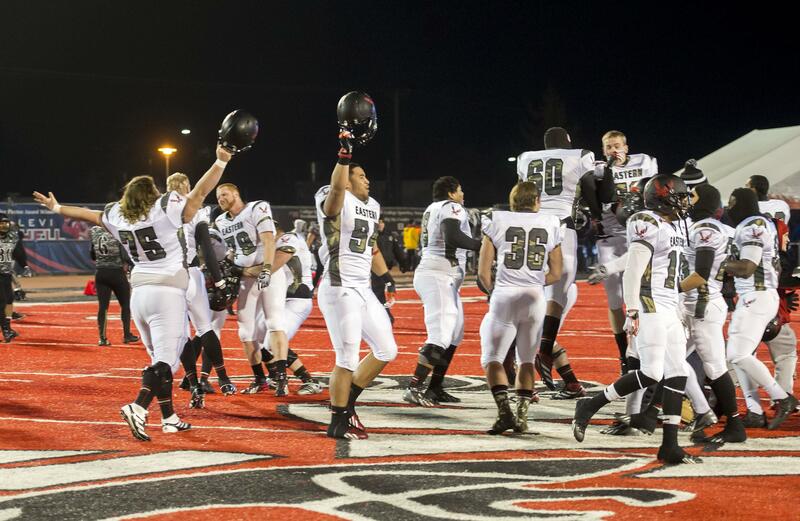 They don’t give trophies for that, but a win also means a share of the Big Sky Conference title and the guarantee of playoff games at Roos Field at least through the FCS quarterfinals. That goes up in smoke if the third-ranked Eagles can’t overcome Portland State, which has been a pesky foe even in a down year. Four years ago, the Eagles needed every one of their 463 passing yards to pull out a 41-34 win in Portland. A year later, a missed extra point by PSU set the stage for Vernon Adams Jr. to throw a game-winning 15-yard touchdown pass to Cooper Kupp with 31 seconds left. Final score: EWU 42, PSU 41. It happened again in 2014 at PSU, which was 3-8 coming in but trailed by just a score with six minutes left. The Eagles finally iced a 56-34 win on Shaq Hill’s kickoff return and a pick-6 by Tevin McDonald. Baldwin expects the same this year. “They know it’s out there, that they control their own destiny,” Baldwin added. Behind quarterback Gage Gubrud, the leading passer in FCS (3,767 yards, 37 TDs and 10 picks) should be able to move the ball against a PSU defense that gives up 482 yards per game. Moreover, the Vikings are yielding 262 yards on the ground, an invitation to an EWU ground game that’s coming off its best effort yet against Idaho State. The Vikings are solid on offense thanks to senior quarterback Alex Kuresa (123-for-224, with 11 TDs and 10 interceptions). Kuresa has rushed for 765 yards and 10 scores, with a long run of 69 yards. Published: Nov. 17, 2016, 11 p.m.